The Angry Birds are back and this time they are in Rio. Based on a new motion picture called Rio, Angry Birds Rio is the latest game from Rovio Mobile in partnership with Fox Digital and Blue Sky. 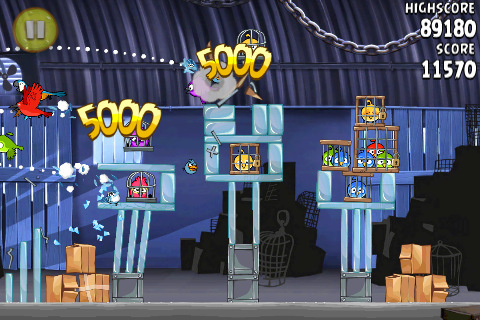 The characters build upon the original Angry Birds with few new additions for added bonus. The first release of Angry Birds Rio comes with 2 stages, each with 30 levels. The first two are Smuggler’s Den and Jungle Escape, with four additional stages scheduled for release in May, July, October and November of 2011. Angry Birds Rio combines the physics-based action of the original game and integrates unique twists based on Rio’s characters. The plot of Angry Birds Rio involves the original Angry Birds who are kidnapped and taken to Rio. They escape and now have to save their friends, Blu & Jewel, the stars of the Fox movie Rio. The birds you fire from the slingshot have not changed for the most part. You still get the red, yellow, white, and blue birds. The level design is not too different from the original AB. In Smuggler’s Den you’re in a giant storage room that looks like an airport hangar. The first episode involves hitting cages to free caged birds. The layout includes cardboard boxes, stones, and storage containers. You also have a few hanging obstacles like chains and wobbling ceiling lamps that you’ll have to avoid or break. In the Jungle Escape episode you’re in a dark and grimy forest with mountain backdrops filled with monkeys, bananas, and palm trees. Here’ you’ll have to break tree branches other hanging obstacles, or try to avoid them to get to the loud and annoying monkeys. The last level in this stage is completely different from what you’re used to. 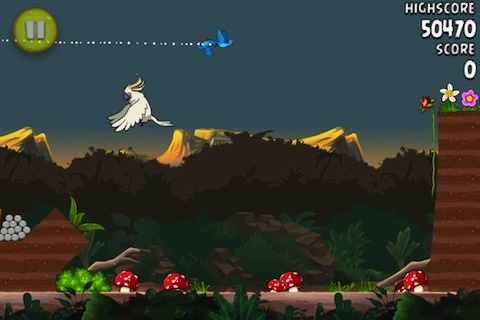 There is a big white cockatoo named Nigel flying around over a canyon which you have to hit with your birds repeatedly to finish the level. This level is all about timing and detonating TNT boxes to set off chain reactions, making rock pieces become projectiles. In this level you get the first glimpse at a brand new fighting bird named B&J. This is a very large blue bird that hangs upside down and when tapped in flight flies across the screen at high speed. There are lots of extra items in the Rio game like hidden fruits that you can collect as awards like cages, trees, bananas and pineapples. The music in the Rio game has been enhanced with flavors of Brazilian samba and carnival. The level design doesn’t exactly look Rio like, at least not in the first two released episodes. Most people imagine Rio as being filled with beautiful people on sunlit beaches and blue skies. You won’t find that in this game, yet. But it is exiting to know 4 new stages are upcoming. If you like killing the evil pigs in the original Angry Birds, you may not be so comfortable with the idea of killing cute monkeys and birds. Performance wise the game flows well generally, though I found there is a slight lag issue in a couple of the levels which I hope Rovio can fix soon. But overall, Angry Birds Rio is definitely worth the dollar price tag. You can finish it in probably a weekend or so given the current 60 levels. Here’s a video trailer of the upcoming Fox movie Rio featuring three rare birds Blu, Jewel and Linda who go to Rio de Janeiro and face a series of adventures. The game which is available for iPhone, iPod touch, iPad, Mac, Nokia, Palm, and Andorid devices. The Rio move will be released on April 15th 2011. Sample the free version of Angry Birds Rio on your iPhone. AppSafari review of Angry Birds Rio was written by Joe Seifi on March 26th, 2011 and categorized under App Store, Featured, Fun, Games, Platformer, Puzzler. Page viewed 7858 times, 1 so far today. Need help on using these apps? Please read the Help Page. I think there are infinite possibilities for the Angry Birds franchise – awareness is off the charts! Looking forward to seeing what Rovio can put together. This is a very fun and tricky game!! !